Our chicken coop is silent and all our chickens gone. Coyotes got them. Early Friday morning as I was getting ready for work, I heard the dog barking the kind of bark that means someone or something is in the yard. I walked out to see a coyote in the chicken coop holding a brown chicken in its mouth. I yelled at the coyote and it ran out of the coop still with the bird. Eventually it dropped the chicken, jumped the fence and it ran down the street. I checked the coop and all six of our chickens were gone. We know there are coyotes in the area and know that neighbors have lost pets. We've been very careful about protecting the chickens and our cats too. But Thursday night apparently the coop door didn't completely latch shut. One mistake on one night was all the opportunity the coyotes needed. It is sad to lose Big Bertha, Brit and the others. And its sad to walk by an empty quiet coop. 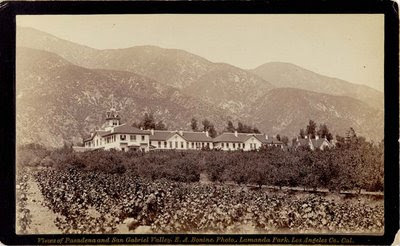 The main residence at the Sierra Madre Villa was this Victorian home built in 1874 by noted artist William Cogswell and his son in law, William Porter Rhoades. Back in the late 1800’s, “the Villa” was world famous as a resort hotel. In the mid-1940’s, the Cogswell/Rhoades house was sold to an up and coming studio in nearby Burbank – the Walt Disney Studio. Disney moved the house up to Porterville where it was used on the set of So Dear to My Heart, a 1948 movie. They modified the old Victorian into a general store and the house appears in the movie as Grundy’s Mercantile. You probably recognize So Dear to My Heart as Burl Ives’ first full length film. But, it was also one of Disney’s first live action films. So Dear to My Heart contains both live action and cartoon characters that appear every so often during the movie. The movie is great family fare – entertaining with a pronounced moral to the story. My kids both liked it. As related by the Villaloa Neighborhood History Society, after So Dear to My Heart was filmed, Disney removed the decorative Victorian trim from the old Cogswell/Rhoades home and placed in storage for later use. The trim quickly found a place on the turn of the century buildings that line Disneyland's Main Street. Seems kind of fitting that trim from the Cogswell/Rhoades home that dates back to Pasadena's pioneer days and recalls the bygone era of the Sierra Madre Villa, was saved and is being re-used on Main Street USA. The photo is interesting. 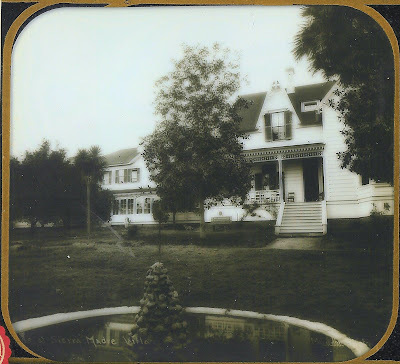 Its a scan of a glass magic lantern slide. 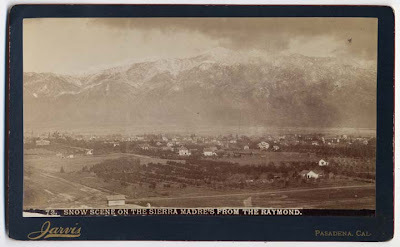 The slide was the work of Los Angeles photographer Frederick Hamer Maude and was probably made around 1890. If you click on the photo, the Victorian trim comes into better focus. 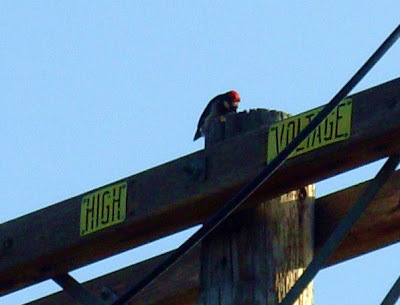 A few weeks ago we watched this acorn woodpecker working away on the power pole in front of our house. The Eaton Canyon Nature Center has a great website that lists the birds, reptiles and animals that live in our area. The acorn woodpecker, and two other woodpecker varieties are common here. Acorn woodpeckers eat insects and, surprise, acorns. They drill holes in trees and even power poles where they store their acorns. Acorn woodpeckers live in extended family groups and are territorial as a group. So, it looks like we have a group of woodpeckers living around here. Now, I'll be watching the power pole to see who else flies in for dinner. We did a lot of work to prepare for a garden this year -- rototilling, weeding, amending, weeding. Did I mention weeding? Actually, I've enjoyed working with the dirt. The tomatoes have been in since early April and we're starting to see some good results.